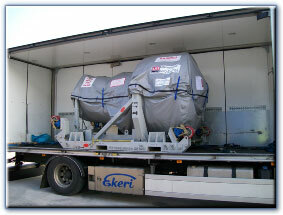 We regularly transport large jet engines and ancillary Aerospace equipment throughout the UK and Europe. Find out more about our payloads in the Gallery. We offer a variety of delivery services - from sameday local and UK to specialist 'Air Ride' transport to suit payloads from 250 kilos to 22,000 kilos. We also have a tail lift facility and offer full proof of delivery and photographic evidence of your consignment's condition, both at pick-up and delivery. Find out more.